W. has done good and he deserves his props for picking Tony Snow as his new press secretary - Helen Thomas watch out! 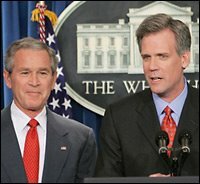 I don't want to brag (too much), but Tony Snow is exactly the type of person I wrote about last month when calling for change in the press secretary position. 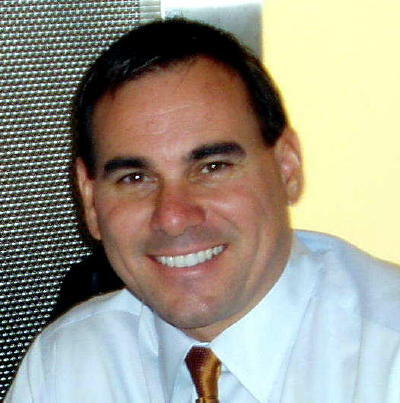 This guy is sharp... in fact, look at this picture and tell me who looks like the President of the United States? Yep - Tony Snow is THAT sharp. Politics is a very funny game and perception is reality when it comes to complex issues where there is no ONE answer. Tony will bring the perception of professionalism and intelligence to the White House by simply looking and speaking well. Hopefully Snow will do more than just put the right face on for the Bush Administration, but ALSO help them think and act differently. Well let's see Tony in action... only then will we know if he deserves HIS props. Picking up USA Today I was shocked, but not surprised that Scott McClellan had resigned as the White House Press Secretary. In my March 14, 2006 posting I suggested that Mr. Bush replace Mr. McClellan and replace him QUICK if he wanted to get a positive message out to the people of this country. I’m not surprised this has happened, but shocked that it is obvious that the President reads TOMKAUFFMAN.COM. I guess I can now call myself a “Presidential Advisor.” Incredible! There are people running the White House that are sharper (all be it slightly), than I am when it comes to Washington politics. If I called for McClellans replacement... it was long overdue. I believe Mr. Bush can really make a positive move here if he finds someone that fits the description I outlined last month. You can lead a horse to water but you can’t make him drink, and just because the White House made a change doesn’t mean they will get the FNG right. I’m hoping this move is not without impact – find a winner W! 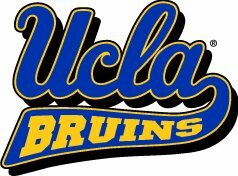 UCLA lost tonight to Florida in the NCAA Final Four Championship game. It was a strange game to watch... The Bruins were down most of the night and after holding LSU to just 45 points in the semis, Florida had their way on the court offensively. Florida shouldn't have made it to the Final Four. Why? Because they are a FOOTBALL school and it was just weird watching them advance in each round. Oh well, they won it all, and congratulations to them and all of their players. UCLA Coach Ben Howland sounded professional tonight after the loss and was complimentary towards the Gators effort... and complimentary of his own team members. He also mentioned one of my heros and one of the greatest figures in college athletics - John Wooden... Coach Wooden went into the hospital today in Los Angeles. Coach Wooden is 95 years old and I imagine he has lived what everyone would agree is a full life. His teams won TEN national championships and he coached some of the greatest basketball players of all time. More than great basketball players, he made them great men, and I have heard him say that the latter was more important to him. If you want to renew your faith in college athletics read a book about John Wooden (check out Amazon.com.) He's the real deal and his ideas and life experience can still impart wisdom, even if he no longer paces a basketball court.